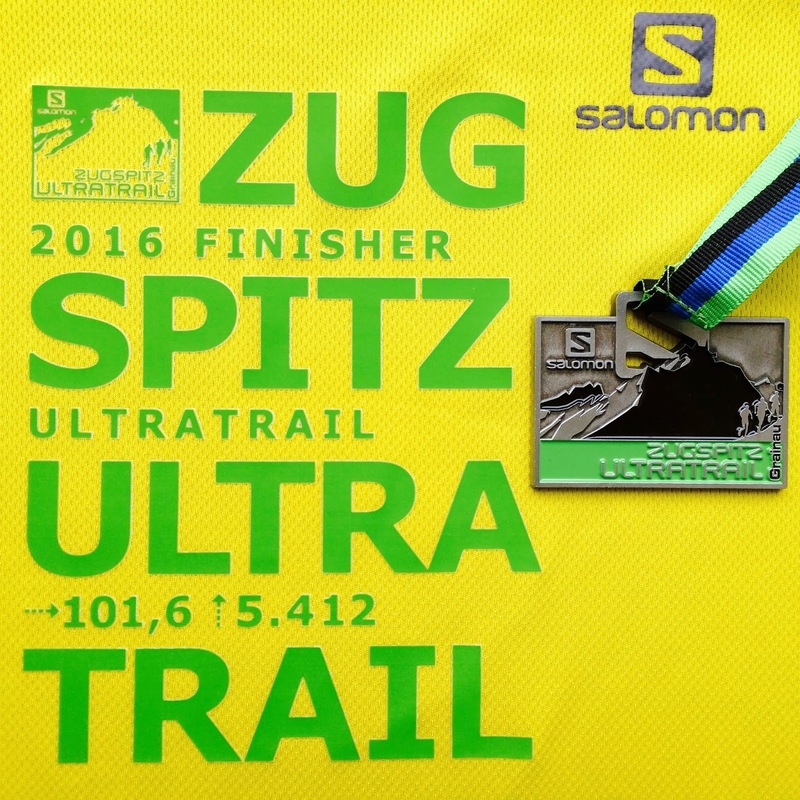 I never planned to do Zugspitz Ultratrail (ZUT). It just sort of happened to me. Fortunately this German's biggest trailrun event allows last-minute registration. It's simple and easy too: just pay the fee, show your ID, sign the weaver, and get your bib. No medical certificates or other bureaucracy. I loved this race already! 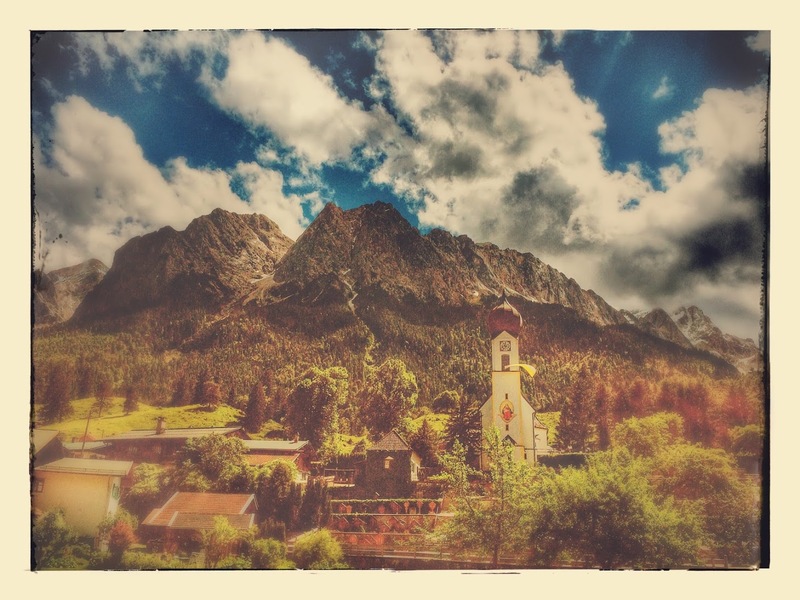 The view from my hotel room window in gRAINau. Having said that, the weather was pretty constantly bad. The guy at my hotel told me it had been raining every day for at least a month. 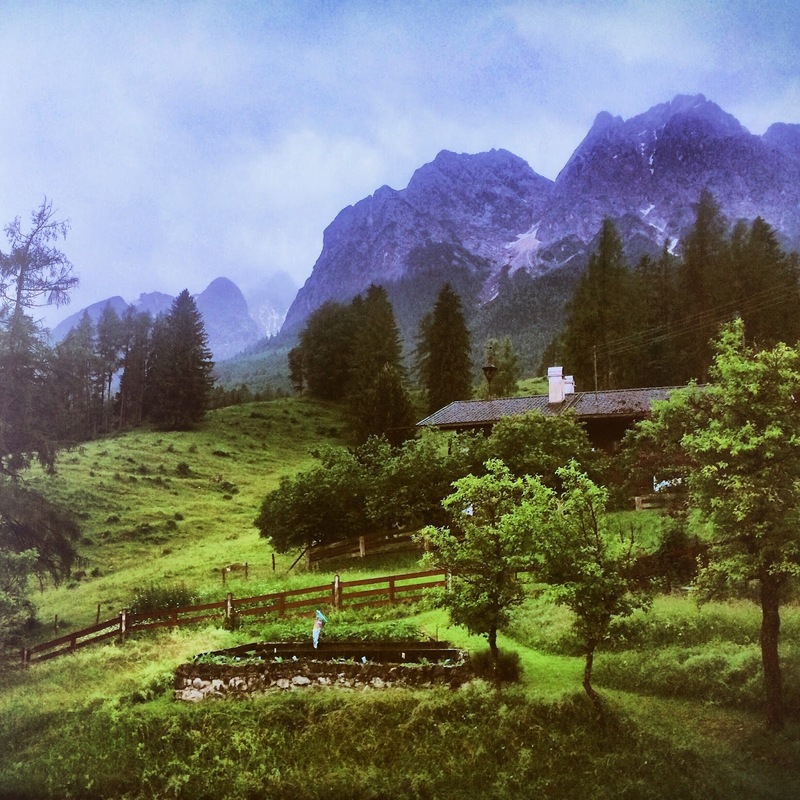 And sure enough, it kept on raining daily during my visit in gRAINau. But don't get me wrong. 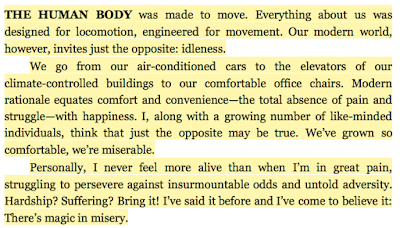 There's magic in misery, as Dean Karnazes wrote in his book RUN! Dean Karnazes: RUN! 26.2 Stories of Blisters and Bliss. 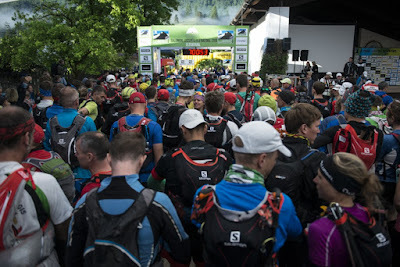 ZUT is a huge event with 2500 runners over five race distances. You never needed to run alone. There was no chance of getting lost. The course was well-marked all the way. The rain washed away some of the sprayed water-soluble markings on the ground, but that wasn't a problem at all. The contents of the backpack we received at registration. After 14km we crossed the Germany/Austria border. Then we ran through the Zugspitz cable car station. The main factor slowing me down was the mud. Most of the trails were soaked wet from previous rainfall, even before today's rain started. Not surprisingly, the conditions got worse and worse. I ran slowly to avoid falling down. Even so, I slipped a few times, but no worries. 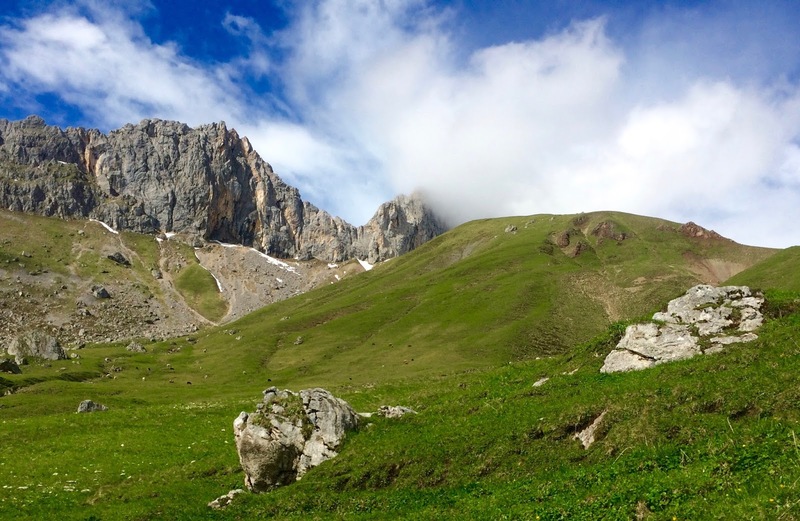 I remembered many of these trails from my Zugspitz Vertical Challenge last summer. Then I had run all the way to the Top of Germany at 2962m. June 18 in Grainau, sunny Saturday morning, rough and ready for 7:15am start! The 102km Ultratrail has officially 5412 meters of elevation gain. Many runners feel it's probably more than that. Anyway it's a challenging course via Ehrwald, Leutasch, Mittenwald and Garmisch-Partenkirchen going counter-clockwise around Zugspitze. The start and finish is in Grainau, so there's the same amount of descent as well. We just have to run around this rock - how hard could that be? The highest point of the race is only at 2206m, but in a hailstorm it felt cold enough for my delicate fingers to start freezing over. I had both merino-wool and water-proof gloves. My blue Haglöfs Goretex jacket proved invaluable once again. For the last half I put on The North Face beanie and Salomon WP pants as well. My Hoka One One Challenger ATR 2 shoes were awesome - no blisters despite they were muddy inside out. I had two pairs, but decided to wear the same pair all the way. After all, this was only a 100K. It didn't rain in the morning and the landscape was fantastic. After 40km we came down to Hämmermoosalm aid station. I must have looked pretty beat up already, because a race volunteer asked if I was the runner who had requested assistance in quitting the race. No way, madam! I was just getting warmed up. One high peak down, two to go. A beautiful section of the course with stunning mountains and rocks all around. The next peak had even more snow than the previous one. The trail ended upon a steep snow slope, with a red arrow pointing straight down. Some parts had ropes to hold on, some didn't. 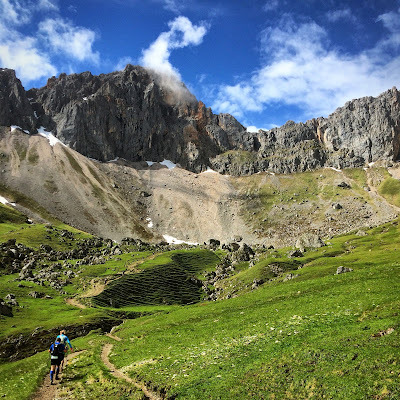 It would have been cool to be able to slide down on your feet like Kilian Jornet in Salomon videos, but let's just say I used other ways to get down. It was super fun too! Grainau crowds going wild for my sub 24-hour finish on Sunday morning 7:10am! In Hubertushof aid station we had only 48km to go. We received our drop bags. 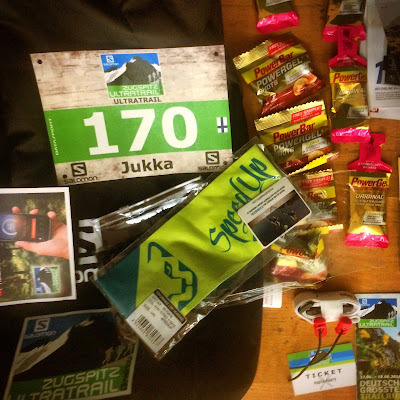 I dug up all the gels from my bag, as they for some weird reason didn't give any at the aid stations. It started raining heavily and I sat down in a tent to wait it out. It never stopped. 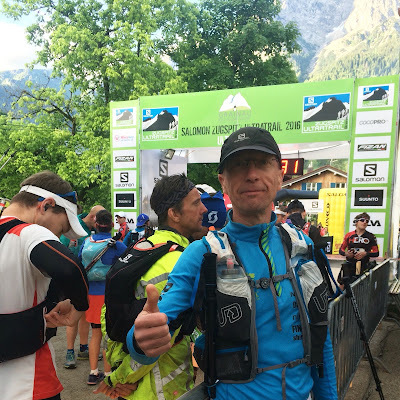 My Swiss Irontrail-buddy Roger appeared and we started together through the rain. 'Are you having fun yet?' I asked. 'No' he said with a serious look. We both knew this would be a long day and night to Grainau. Proud owner of ZUT finisher T-shirt and bling! Fortunately the route was fairly easy until the climb up to Partnachalm at 82km. I explored this area with my son last summer, so I was looking forward to the nice trail up to AlpspiX at 2050m. However we didn't go that route, but a hellish mudpath with fallen logs and other obstacles all over. It was pitch dark and raining cats and dogs. My 1000-lumen Lumonite Compass R headlight and Black Diamond Distance Carbon Z-poles were most helpful tools to get me through the night. And lots of coffee or course. 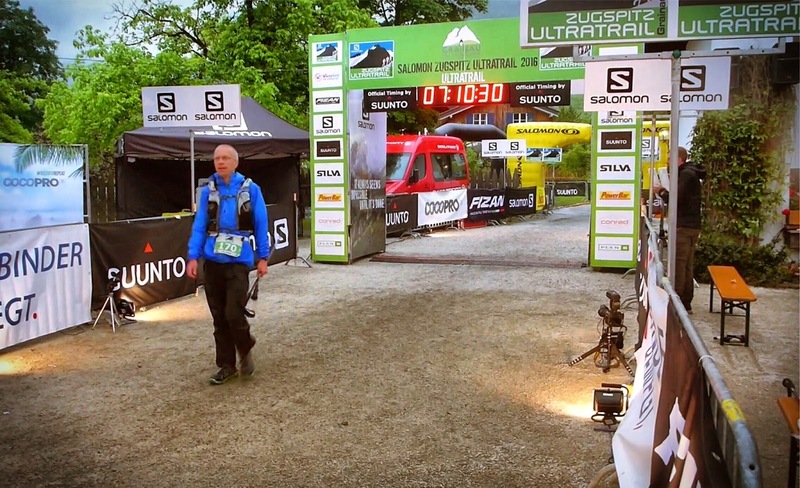 Zugspitz Ultra Trail 2016 from luukai on Vimeo. The last 7km were mostly downhill in faint morning light. I finished in just under 24 hours, slightly over two hours before the final cutoff. I was very proud and happy to be one of 388 Ultratrail finishers. Out of 634 starters, only 246 Did Not Finish. 39% dropout rate is not bad considering the weather. We ultratrailrunners are a tough bunch, ZUT provided valuable mountain experience for Swiss Irontrail. I could never have pushed myself this hard in any private training session. I hope ZUT happens for me again. 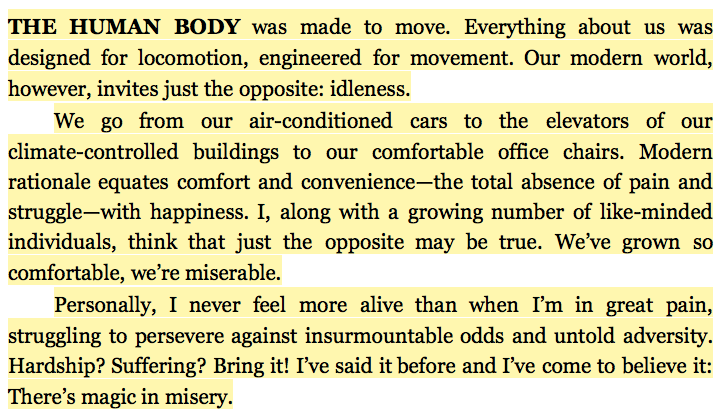 There's magic in misery.